SNMP-Simple Network Management Protocol is used to provide management capability for TCP/IP based networks. There are three versions (v1, v2, v3) & only version 3 added the security capability to this protocol. If you are using this SNMP to manage & configure your network devices, it is better to use SNMPv3 which provide authentication & encryption capability to this protocol. You can read RFC3411- An Architecture for Describing SNMP Management Frameworks if your are interested in more details about this protocol. There are 3 level of security you can provide to any SNMPv3 messages. authPriv – with authentication and with privacy. In this post we will see how to configure SNMPv3 on a Cisco IOS device (5760,3850, Autonomous AP) & a Cisco WLC (5508) in order to manage via Prime Infrastructure as Network Management System(NMS). Let’s configure this on a 3850 switch. First we will create a snmp group (called SNMP-GRP) with “authPriv” secuirity level. If you want you can associate an ACL to restrict which NMS host can be part of this group. But in this example I have used without that to make it simpler. 3850-3(config)#snmp-server group SNMP-GRP v3 ? 3850-3(config)#snmp-server group SNMP-GRP v3 priv ? Now let’s define a SNMP user for this group with required Authentication & Encryption parameters. As you can see below 3850 supports 128,192, 256 bit AES encryption & you can choose any. I have chosen 128bit as that’s what Prime Infrastructure is supported. I have used “HMAC-SHA” over “HMAC-MD5” since it is more secure. 3850-3(config)#snmp-server user prime2 SNMP-GRP ? 3850-3(config)#snmp-server user prime2 SNMP-GRP v3 ? 3850-3(config)#snmp-server user prime2 SNMP-GRP v3 auth ? 3850-3(config)#snmp-server user prime2 SNMP-GRP v3 auth sha ? 3850-3(config)#snmp-server user prime2 SNMP-GRP v3 auth sha <AUTH_PASSWORD> ? 3850-3(config)#snmp-server user prime2 SNMP-GRP v3 auth sha <AUTH_PASSWORD> priv ? 3850-3(config)#snmp-server user prime2 SNMP-GRP v3 auth sha <AUTH_PASSWORD> priv aes ? 3850-3(config)#snmp-server user prime2 SNMP-GRP v3 auth sha <AUTH_PASSWORD> priv aes 128 ? 3850-3(config)#snmp-server user prime2 SNMP-GRP v3 auth sha <AUTH_PASSWORD> priv aes 128 <PRIVACY_PASSWORD> ? Now if you go to Prime Infrastructure (PI), you can add this switch with the configured SNMPv3 details. To fully manage the switch PI need to access the switch via CLI (ssh/telent), so better to configure CLI credential as well for that purpose. Note, that when you add a 3850/3650 switch to Prime it will automatically treated it as a WLC as well (since those switches has integrated WLC within the switch). So same 3850 appear under Controllers & Switches section. Let’s configure this on 5760 controller. Since it is IOS device, you have to simply add those two lines. You can verify your configuration using “show snmp-server group” & “show snmp-server user” outputs as shown below. Let’s see same configuration on Autonomous Access point (again IOS device). So there is no difference, only those two lines required. But some time depend on the AP hardware & IOS version you running on the AP, all these encryption may not supported. For example 1252 with 15.2 support AES encryption where as 1131 running on 12.4 version only support DES for SNMP encryption. AAP2(config)#snmp-server user prime2 SNMP-GRP v3 auth sha <AUTH_PASSWORD> priv ? Now let’s see how we can configure SNMPv3 on a 5508 (run on AireOS). Since it is not IOS command syntax is different, but again it is one simple config line. I have not shown the GUI method here, but if you are more comfortable with that you can do it in that way too. (5508-1) >config snmp v3user create ? <username>     Enter user name for a v3 user. (5508-1) >config snmp v3user create prime2 ? (5508-1) >config snmp v3user create prime2 rw ? none           Disable authentication protocol for a SNMP v3 user. hmacmd5        Set the SNMP v3 user authentication type to HMACMD5. hmacsha        Set the SNMP v3 user authentication type to HMACSHA. (5508-1) >config snmp v3user create prime2 rw hmacsha ? none           Disables encryption type for SNMP v3 user. aescfb128      Set the SNMP v3 user encryption type to AES. des            Set the SNMP v3 user encryption type to DES. (5508-1) >config snmp v3user create prime2 rw hmacsha aescfb128 ? <authkey>      Enter authentication key for authtype hmacmd5/hmacsha for a v3 user. (5508-1) >config snmp v3user create prime2 rw hmacsha aescfb128 <AUTH_PASSWORD> ? <encrypkey>    Enter encryption key for for des encryption for a v3 user. You can verify “show snmpversion” & “show snmpv3user” CLI commands. There is default SNMPv3 user called “default” & you can delete that using “config snmp v3user delete default” if needed. In the below I have deleted that user. In this way you can make sure Prime Infrastructure to your managed devices communicate in secure fashion (SNMPv3). 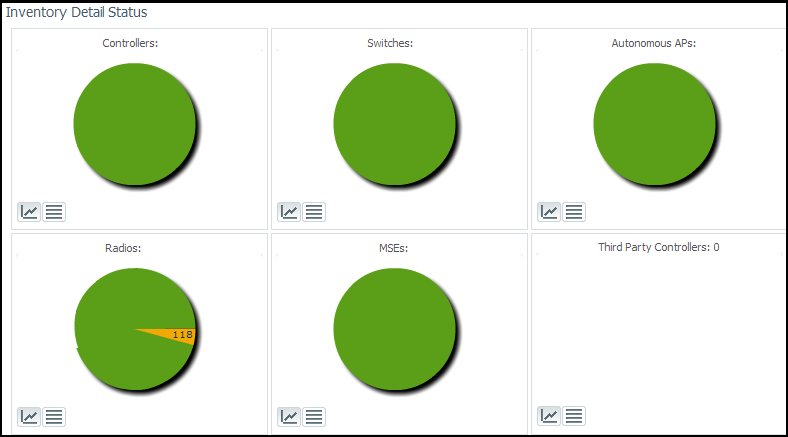 Here is a sample PI dashboard showing this managed devices. 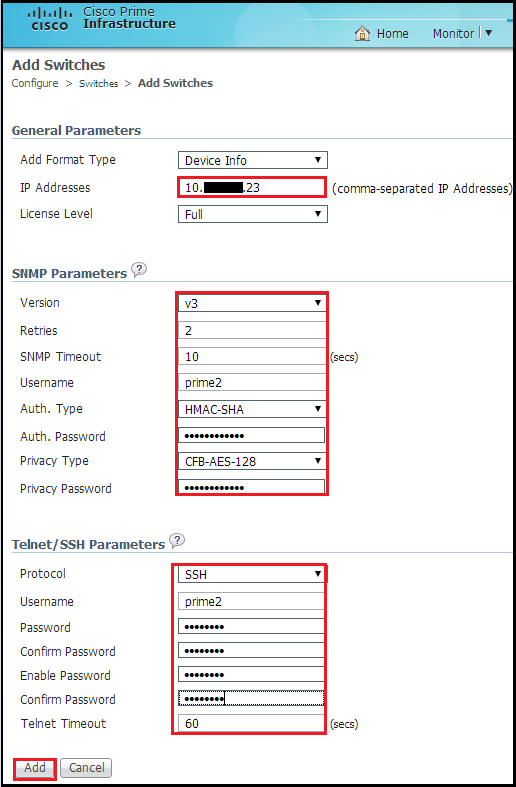 Here is a quick reference link from Cisco if you want to configure & verify SNMPv3 on Cisco devices. Hi. How can i do in order to see my 3850 like a Switch instead a WLC? I need configure seetings in the interfaces and with this mode i can´t. It gives an SNMP Operation failed error message though Prime 1.4 when i am push SSID thru Prime. however i am able to push other templates /config. and why trap required snmp configuration ?? I had been trying to configure this scenario using an AP 1600i in autonomous mode and prime in version 2.1, but I cant do it , I did all the steps in your blog but didn´t work. Please, help me with this if maybe I missed something, I will appreciate it . Did you try it with different codes of AP ? If not I would try that first. I have a question regarding Cisco Prime I hope you can answer. If I create and deploy a template (in my task a WLAN Template), I take it this does not save to NVRAM by default? If not, do I need to either run another CLI template with this command or save directly on device?